“I do not seek office for personal gain, my priority is to stand up for the people of Crewe and Nantwich”, said David Williams, Labour’s Parliamentary Candidate for Crewe and Nantwich. David continued, "As a measure of my intention to try and restore an element of trust between voters I have joined other Labour Prospective Parliamentary Candidates to put on record the following five pledges which will govern our conduct if we are elected to Parliament. "A great many of our current Members of Parliament already embody these principles in their day-to-day conduct and their example should be recognised. "I do not want a return to a system where only the wealthy can seek election to Parliament, so necessary reforms to the system of MPs’ expenses and allowances should acknowledge the legitimate need for appropriate accommodation and travel expenses. "In the absence, however, of a decision on the final form of the new system, these pledges will act as my guide if I have the honour of being elected to the House of Commons." • I will apply the principle of best value to all decisions I make which involve the use of public money to cover my duties, including for travel and accommodation. David has also made specific promises to the voters of Crewe and Nantwich, which can be viewed here. We are all used to the bizarre ramblings of Cllr Robert Parker, but his letter (Chronicle 20 May) about the Government's Car Scrappage Scheme is wholly inaccurate. You do not have to buy a vehicle for more than £10,000 to participate in the scheme. Had Cllr Parker looked at pages 58 and 59 of that edition of the Chronicle he would have seen a double page advertisement from Grenson's offering a very competitvely priced brand new car for £4,795, reduced by £2,000 because of the Government's scheme. So I hope that Cllr Parker will tell his friends that he got it completely wrong, that because of the Government's scheme they can buy a brand new car for under £5,000 and they have Labour to thank for this. “It’s time the Tories told us where the axe will fall on Labour’s rail investment”, said David Williams, Labour’s Parliamentary Candidate for Crewe and Nantwich. David Cameron pledged swinging cuts across Whitehall, including in the Department for Transport budget. Since then he has promised an “age of austerity” with cuts, more cuts and even more cuts in public spending, but he refuses to say where the axe will fall. By contrast Labour has invested heavily in the railways and there are more passengers using our trains than at any time since the Second World War. The Government is continuing to invest, with over £20bn in enhanced rail capacity and new and improved trains. “The contrast could not be more stark”, continued David Williams, “Labour is prepared to invest in our transport infrastructure to help us grow our way out of recession. The Tories are pledged to cut their way out of recession and we in Crewe and Nantwich know exactly what that means. “The Tories’ privatisation of Crewe Works destroyed thousands of rail manufacturing jobs and brought the industry to its knees. Skills were lost and generations of school leavers missed the opportunity of an engineering apprenticeship. It was exactly what we predicted when I was helping Gwyneth Dunwoody with her anti-privatisation campaign. “Labour has been rebuilding our railways after chronic Tory under-investment and Railtrack's mismanagement. I am fighting to make sure that Crewe has a railway future, not just a railway past. David Williams, Labour's Parliamentary Candidate for Crewe and Nantwich, today joined the Wage Concern lobby of Parliament, where they scored an early victory in the campaign to stop the Tories from abolishing the minimum wage. Tory MP, Christopher Chope, bottled it today and postponed the second reading of his Bill until June 12th. Faced with having to defend his disgraceful Bill on the BBC Radio 4 Today Programme, Mr Chope declined the debate with Usdaw General Secretary John Hannett and pulled the Bill. David Williams said, "It doesn't surprise me that the Tories ran for cover as soon as the spotlight was put on their disgraceful attempt to pull the rug from under low-aid workers. "This Bill would result in the end of valuable wage protection for working people and I won't be just those on the minimum wage that will suffer. If the floor is removed, then everyone’s wages will spiral downwards. "The campaign continues, because we cannot allow the Tories to undermine the minimum wage which has transformed Britain's Labour market for the last ten years." John Hannett, Usdaw General Secretary and member of the Low Pay Commission, said: "This shows the Tories in their true light and is a little insight into what a Conservative Government would do. They are still fighting the battles of the 1980s and 90s when they abolished the wages councils and left my members and millions of other workers without wage protection. David Cameron talks about an age of austerity, well we now know that he means it for low-paid workers." John Prescott MP added, "Only a Tory could suggest that not being able to work for less than minimum wage would be a denial of Human Rights. This from a party that actually wants to abolish the Human Rights Act and provide cheaper labour. I call on everyone who believes in fairness and social justice to join Wage Concern and help us kill this Tory Bill." Crewe Blog has covered the story, following my press release: Behind the scenes, a Private Members Bill to allow companies to opt out of the minimum wage has caused a bit of a kerfuffle. Now Crewe is a hard-working town and many of its inhabitants earn a basic wage. Surely, as some put it, "scrapping" the minimum wage would have disastrous consequences for many. That in itself is OTT as we're talking about chat and debate in the corridors of power. Still, a bill that promotes the idea of allowing companies/workers to choose pay levels deserves closer inspection. It's certainly something that worries Labour's David Williams who points the finger at a few Conservatives who have tabled a bill that gets its second reading this Friday in the House of Commons. To clarify matters, there are 11 Conservatives backing the bill at present, as listed here on www.parliament.uk under the "Employment Opportunities" section. Williams is backing a campaign to stop the bill in its tracks and you can get more information here on the Wage Concern website. However, Crewe MP Edward Timpson has been quick to distance himself from the bill and has told the blog that he is 100% behind the National Minimum Wage. That will put many Crewe folk at ease, but the fact that a few MPs are keen to promote such a bill is worrying. Thoughts? I would be more reassured by our MP's 100% support for the National Minimum Wage if I thought he had any influence on Tory Party policy. At best a Conservative Government would let the minimum wage wither on the vine with little or no increases until it becomes virtually worthless. At worst they will introduce exemptions, as proposed in this Tory Bill, that will effectively abolish this vital wage protection. The Tories have never been committed to the minimum wage and this Bill gives us a little insight into what they will do in Government. We know that they are also committed to a bonfire of basic employment rights including equal treatment for part-time workers, paid holiday and everything else delivered through Labour signing the European Social Chapter. Tomorrow I will be in Parliament persuading MPs to vote down this disgraceful Bill. I assume that as our MP is 100% behind the minimum wage he will be in the House to vote against second reading this Tory Bill? David Williams, Labour's Parliamentary Candidate for Crewe and Nantwich has today warned of cuts, more cuts and even more cuts if the Tories get into power. - Cutting Labour's guarantee that all people under the age of 25 who are unemployed for a year will receive either a job or training. - Cutting this year's £60 cash boost for pensioners while threatening to do away with free TV licenses and free bus passes for the elderly. - Cutting support for families under real pressure who need to defer interest payments so they don't lose their homes. - Scrapping the right for every patient to see a cancer specialist within two weeks if they are suspected of having cancer. - Cutting £160m from crime-fighting budgets - the equivalent of losing three and half thousand police officers. David Williams said, "You cannot cut your way out of a recession, you have to grow your way out of recession. It is right that Labour continues to support people in these difficult times." 1. How much does your family firm pay you for your second job? 2. How many hours do you work for Timpson's? Parliament has voted for this information to be published. Don't wait to be forced to declare, tell us now. Please click here to see the full debate. Plenty in the news about MPs expenses, so it's good to see that our local representative has enjoyed a controversy-free first year in office. I've had a poke around and it's clear that Edward Timpson's office declares everything - as it should do. And in terms of accommodation in London, well, he rents a modest flat for his time in Westminster - no second home! As for his role, I reckon he can truly claim to have concentrated upon his job of representing Crewe & Nantwich. I sincerely hope that Mr Timpson's affairs are as straight forward as your article suggests. Political party aside, we have to work to rebuild voters’ trust in the political process. But to say that his office declares everything is not true. We know that Mr Timpson is paid by the family firm, but we don't know how many hours a year this takes him away from parliamentary duties or how much he is paid for this work. Parliament voted to make that information publically declarable and what I am asking of Mr Timpson is he publishes those details now, not wait for the authorities to force it out of him. MPs should be open, honest and accountable. The people of Crewe and Nantwich deserve to know how much their MP has been paid since he was elected. “This is a real boost for all low-paid workers in these difficult times”, said David Williams, Labour’s Parliamentary Candidate for Crewe and Nantwich. The Government has today accepted the Low Pay Commission’s recommendation for a 1.5% increase in the top rate of the National Minimum Wage. David Williams continued, “In this global economic recession it is important that workers do not see their basic employment rights cut or diminished. This announcement means that the minimum wage continues to offer valuable pay protection for the most vulnerable workers in Crewe and Nantwich. It also stops bad employers undercutting good employers by reducing wages. “Contrast that with the Tories who are proposing to effectively abolish the minimum wage. Their legislation undermines minimum wage regulations and will leave low-paid workers at the mercy of unscrupulous employers. John Prescott is urging you to join the campaign. This is really important we need your help. 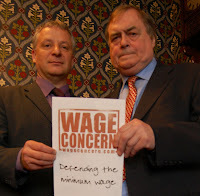 Please visit the Wage Concern website and give your support. We cannot let the Tories take away the National Minimum Wage. Please click here to go to the Wage Concern website. “It’s time for MPs to come clean on their second jobs”, said David Williams, Labour’s Parliamentary Candidate for Crewe and Nantwich. Speaking to a meeting of the Executive Committee of Crewe and Nantwich Labour Party, David Williams said, “We need to know exactly how much time MPs spend away from parliamentary duties and how much they are paid. “In Crewe and Nantwich our MP is paid by the family firm as well as picking up a MP’s salary. We have no idea how much he is paid or how many hours he has to work or what exactly he does for the company. “It’s time Mr Timpson came clean, told us how much income he has received from Timpson’s Ltd since he was elected and how many hours he has worked for them. We also want to know how much he was given by his second employer to do up the constituency office”. In his address to key local Labour Party activists and councillors, David Williams promised to uphold the highest standards of public life. 1. I will be a full-time MP, working only for the people of Crewe and Nantwich, with no second income. 2. I will not profit from the second homes allowance, because I will only rent accommodation. 3.I will live in the constituency, which will be my main residence and the family home. 4. I will not employ or pay money from the MP’s allowance to any member of my family. 5. I will publish all my income and expenses claims, so they are available to local voters. “Join the campaign, sign the petition and save the minimum wage from the Tories”, urged David Williams, Labour's Parliamentary Candidate for Crewe and Nantwich. A Tory Bill has been introduced in the House of Commons that will totally undermine the minimum wage and drive millions of workers back to poverty pay. David Williams is now asking all Crewe and Nantwich people to save the minimum wage by signing the petition launched today at www.wageconcern.com. The Employment Opportunities Bill, tabled by Senior Conservative Christopher Chope, who as a minister helped bring in the Poll Tax, is timetabled for its second reading in Parliament next Friday 15 May. “The minimum wage provides valuable income protection and security for millions of workers in Crewe and Nantwich. It stops unscrupulous employers from driving down wages and leaving workers on poverty pay. This new Tory Bill would allow employers to opt out of their responsibility to their staff to pay a fair days wage for a fair days work. “This shows the Tories in their true light and is an insight into what a Conservative Government would do. They always opposed the introduction of a minimum wage and they are still fighting that battle. David Cameron talks about an age of austerity, well we now know that he means it for low-paid workers." The Labour Government introduced the National Minimum Wage in 1999 to ensure decent wages for the low paid and to create a level playing field for employers so that better employers could not be undercut by the worst payers. Following the last Conservative Government’s abolition of the Wages Councils in 1993 there had been no legal protection for wages and in some areas low skilled jobs were routinely paid at less than £2 an hour. The introduction of the National Minimum Wage in 1999 at a rate of £3.60 gave over 2 million workers an immediate pay rise. Millions more have since benefited every year as the rate has increased by almost 60% over 10 years to £5.73 an hour today. If you think you are not getting your entitlement please phone the National Minimum Wage helpline on 0845 6000 678. They're open Monday to Friday 9am to 5pm. Please click here to sign our petition to save the minimum wage from the Tories. “I am very concerned to hear of another 86 job losses at Crewe Works”, said David Williams, Labour Parliamentary Candidate for Crewe and Nantwich. Today Bombardier Transportation UK Ltd announced further redundancies at Crewe, 75 from the shop floor and 11 office staff. “The Government recently announced that Bombardier had won a £155 million contract to produce 120 carriages for an expanded East Anglia rail service, but this work will be carried out at the Derby site. A new Party Election Broadcast by the Labour Party argues you cannot cut your way out of recession - you’ve got to grow your way out of it. It says that together we can fight back against this international recession and build a stronger, fairer Britain. The broadcast highlights the stark contrast between Labour action now and the last recession when people were left to fend for themselves. It sets out the clear choice between Labour plans to grow Britain out of recession or the alternative: public service cuts for everyone at the worst possible time. A new campaign aimed at tackling knife crime is being backed by David Williams, Labour's candidate for Crewe and Nantwich. David is urging local retailers to sign up to a knife pledge which will limit the availability of knives to under-18s. “By stopping under-18s getting access to knives in the first place, we can help to stop knife crime. The knife crime pledge is an important part of the Government’s strategy to tackle knife crime. "I know from my work for Usdaw, the shopworkers union, that this knife will make a big difference. Our members tell me that clear policies that are understood by customers make it a lot easier to police age related sales on items like knives. - enhance safeguards on internet sales to address attempted underage sale of knives; -- and monitor attempted underage sales and share information with local police and other partners.